John Hunt Morgan was a Confederate cavalry officer during the American Civil War best known for leading a raid into Indiana and Ohio during the summer of 1863. Born to wealthy slaveholding parents in Huntsville, Alabama on June 1, 1825, Morgan and his family moved to Lexington, Kentucky five years later. Morgan eventually enrolled in the city’s Transylvania University, but school officials expelled him for dueling two years after he began attending the institution. Morgan’s military career began in the U.S.-Mexican War, which occurred from 1846 to 1848. Before the war's conclusion, he attained the rank of first lieutenant in a cavalry regiment. Although he returned to civilian life at the end of the war, it would not be long before he was active in the military again. He joined the Confederate army at the outbreak of the American Civil War, enlisting as a captain in the Lexington Rifles, a unit of Kentucky volunteer cavalry under the command of General Simon Buckner. General Braxton Bragg quickly took notice of Morgan’s ability as a cavalry leader, and Morgan was serving under Bragg during late 1862 and early 1863. Bragg ordered Morgan to conduct raids on Union army supply depots and also to destroy Northern transportation lines. Most of Morgan's attacks occurred in Tennessee and his home state of Kentucky. One of Morgan’s most efficient raids took place in Hartsville, Tennessee on December 7, 1862. Morgan's command successfully captured nearly an entire Union force. Morgan's men killed, wounded, or captured 1,855 Northern soldiers, while the Southerners lost just 149 troopers. Due to this success, Confederate authorities promoted Morgan to the rank of brigadier-general. 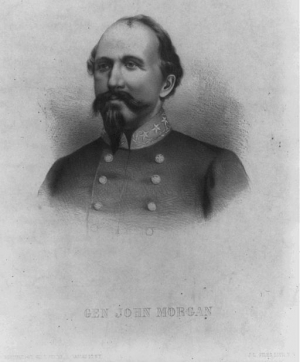 Morgan participated in the Battles of Shiloh, Tennessee, the Siege of Corinth, Mississippi, and also conducted several raids into Kentucky and Tennessee. Morgan is perhaps best known for his raid into Indiana and Ohio during the summer of 1863. He led his force to northern Kentucky to create disorder within the Union military. Morgan succeeded in causing unrest for the enemy and exceeded his orders by crossing north of the Ohio River. On July 8, 1863, Morgan and approximately two-thousand soldiers crossed over the river into southern Indiana. While journeying into the Hoosier state, Morgan's men, known as Morgan's Raiders, began to spread false rumors that the Confederates planned to attack the state's capital of Indianapolis. After spending five days gathering supplies and horses from Northern civilians in southern Indiana and with the Indiana Militia approaching closer, Morgan and his men moved into Ohio on July 13. They entered Ohio near the Hamilton-Butler County line. For the next two nights, Morgan led his soldiers to the outskirts of Cincinnati, where the Union Army's Camp Dennison was located. On July 15, Morgan divided his men, sending one detachment through Warren, Clinton, Fayette, Ross, and Jackson Counties. The other, the main section of his force, crossed the Scioto River at Piketon to reach Jackson, traveling through Clermont, Brown, Highland, and Pike Counties. Once they reached Jackson, the two sections reunited. Now the full force journeyed east through Jackson, Gallia, Vinton, and Meigs Counties in the hopes of reaching the Ohio River. Three evenings earlier, on July 12, Ohio Governor David Todd issued a proclamation. The document directed the Ohio militia to muster to protect the state from Morgan's men. Many militiamen did not hear of the governor's order, and luckily for Morgan, his army faced little opposition. However, on July 18, the Confederates met a small force of militiamen at an earthwork, slowing Morgan's advance. Finding themselves severely outnumbered, the militia retreated that evening. The militiamen's efforts allowed for Brigadier-General E.H. Hobson's Union cavalry to locate the Confederates. Additionally, Union General Ambrose Burnside sent soldiers and gunboats to patrol the Ohio River, hoping to intercept Morgan's Raiders as they crossed the river. Identifying a ford near Buffington Island, an island in the Ohio River, Morgan's men tried to cross the river. Only a small number of men successfully crossed the river, as Union soldiers under Hobson and General H.M. Judah had arrived. A battle erupted between Morgan's 1,700 men and the North's approximately three thousand soldiers. Morgan never filed a battlefield report, and the Union officers involved failed to provide detailed reports. Specific battlefield movements are unknown. Historians estimate the number of killed or wounded Southerners from between fifty-two and 120, with an additional eight hundred to 1,200 men being captured. Daniel McCook of the Fighting McCooks was one of twenty-five soldiers whom the North lost in the battle. Morgan himself and his remaining force managed to break through the Union lines and traveled north along the river, trying to find a place to cross. They found an unprotected ford approximately twenty miles north of Buffington Island, where several hundred Raiders forded the river before Union gunboats intercepted the rest of the Confederate force. Morgan then led his last group of men westward through Meigs and Gallia Counties. He eventually moved to the east and north, traveling through Vinton, Hocking, Athens, Perry, Morgan, Muskingum, Noble, Guernsey, Harrison, Jefferson, Carroll and Columbiana Counties. Unfortunately for Morgan, Major W.B. Way's and Major G.W. Rue's Union cavalry captured Morgan and his remaining soldiers at Salineville, in Columbiana County. Morgan's Raid and the Battle of Buffington Island did succeed in scaring Northern civilians in Ohio and Indiana. The event also caused some Ohioans to suffer financially. Approximately 4,400 Ohio residents sought a total of $678, 915.00 from the federal government in compensation for their losses. The government eventually reimbursed these Ohioans $576,225.00. The raid also helped buoy the declining spirits of some Southerners, especially following Confederate defeats at Gettysburg, Pennsylvania and Vicksburg, Mississippi in early July 1863. Most scholars, however, believe that the raid caused more harm than benefits to the Confederate military. Morgan's soldiers accomplished little, inflicting no significant damage to Northern railroads, bridges, telegraph wires, or supply depots. The North did not have to dispatch any significant numbers of men from the frontlines to deal with Morgan's threat. In the end, the Confederacy lost nearly 1,600 veteran cavalry soldiers killed or captured. The limited property damage and slight boost to Confederate morale could not outbalance the loss of these men to the Confederacy. Following his capture, Union authorities transported Morgan and most of his command to Columbus where they were imprisoned. Officials placed the enlisted men at Camp Chase, a prison camp, while officers served their time at the Ohio Penitentiary. Arriving on October 1, Morgan and a few other prisoners began to plot an escape attempt. On November 13, 1863, the plotters tunneled out of their cell and into an airshaft. Remaining imprisoned for two weeks more, Morgan and six prisoners crawled through the airshaft to prison yard on November 27, 1863. From the yard, the escapees used their prison uniforms to create a rope, allowing them to climb over the prison wall. escaped. During his time in prison, Morgan's sister had sent him some one thousand dollars concealed in a bible. Once free, Morgan used this money to purchase a train ticket to Cincinnati, Ohio, where he crossed the Ohio River into Kentucky. Morgan rejoined the Confederate military, but Union forces killed him less than one year later on September 4, 1864. Northern soldiers surrounded a farmhouse where Morgan was staying near Greenville, Tennessee. He tried to escape the house, but Union soldiers mortally wounded him. He was buried in his hometown of Lexington, Kentucky.